Second best vegan place in the city after Teva. Cozy atmosphere. Really tasty and natural food. Very friendly staff and owners. Located far away in Recreio and is hard to reach without a car, but once you are there, you won’t regret it. Some weekends there is a special vegan pizza night with live music. Otherwise, the restaurant closes already at 5 pm. There is only one lunch menu option that changes every day. Tiramisu dessert is absolutely the best! Has a wide variety of delicious dishes. Menu changes every day of the week. The only shortcoming is that most vegan-friendly dishes are cold and sometimes a bit bland. Has several locations across the city. Offers vegetarian burgers that are popular even among meat-eaters. For vegans, there is one sort of vegan burger, also some salads and vegan cookie. Offers vegan sushi option as well as vegan yakisoba. There is also vegan and vegetarian all-you-can-eat sushi buffer during certain hours. Many pay-by-the-kilo restaurants in Rio are quite vegan-friendly. My favorite one is Taipei in Barra Shopping, offering Asian cuisine with many vegan salads and some other dishes. Vegetarian restaurant is a part of Hare Krishna complex which also includes a Krishna temple, an Indian shop and an organic fruits and vegetables market. The restaurant offers simple home-made food. A good option to stop by on your way to Floresta da Tijuca. One of the newest vegan-friendly restaurants in Rio. Stylish design and delicious food. Best vegan gnocchi you can ever find. The prices are high. 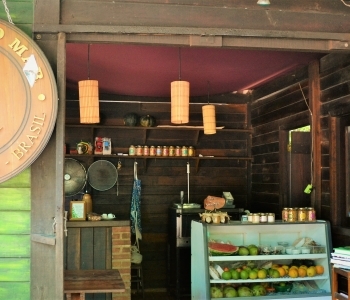 Located on a quiet street on the shore of Tijuca Lagoon, Pura Vida offers relaxed atmosphere and tasty food. On weekends and public holidays there is a delicious vegan breakfast buffet. Definitely try vegan pão de queijo - it’s hard to find in other places. Those who buy breakfast and rent a stand-up paddle get a discount. 100% vegan food, or at least they promise so. Has a wide choice of all kind of dishes. Pizzas with vegan cheese and some mixed juices are the best. Chocolate cake is also quite good. The staff is friendly and welcoming. Great place to buy food, cosmetics, food supplements, etc. Relatively expensive, as all vegan products in Rio. The price level is more or a less the same as in other organic/vegan-friendly stores. Veganza has the best choice of vegan vitamins and food supplements. Quite many options for vegans. Extremely expensive, but tastes great. Vegan cappuccino and latte with home-made cashew milk is highly recommended. Vegan cakes are also awesome; ask several times from different bartenders to make sure which ones are really vegan. Australians will be happy to find vegemite. Savá promotes healthy food for those who don’t have time. All dishes are packed into small boxes and are ready to be consumed. Several options for vegans. Best for lunch, doesn’t have anything special for breakfast (except Saturdays) nor dinner. One of the few places to find vegan cheese bread (pão de queijo) filled with potato instead of cheese. Mexican place where you choose your burritos’ fillings yourself, so it’s easy to make it vegan. An example of vegan burrito step by step: veggie – whole grain rice – olives & mango salad – guacamole. A vegan-friendly and organic place with two locations in Ipanema. They don’t have almost anything for breakfast. For lunch, proteins and salads are packed into small boxes ready to be consumed. Rice, beans and similar are included into self-service buffet choice. For dinner, vegans can choose between two sorts of pizzas which taste close, but not exactly like pizza. Being a part of a spa hotel, Spazziano offers lunch buffet and is closed outside lunch time. I would call it a vegan paradise, both because of the variety of choice and great taste, as well as very cheap price for all-you-can-eat option. Best vegan food you can find in Zona Sul area. If you are ok with eating at a simple canteen type place, then it might be a good option for you. The buffet offers several vegan dishes to choose from, both cold and hot. If you prefer more sophisticated places, you might not like New Natural. It also has an organic grocery shop, although not all the items are as natural as the name promises. The price range is a little bit below average for Ipanema area. Small cozy cafeteria between Ipanema beach and General Osorio square. Offers the best vegan tapioca and brownie you can find in Rio. Not particularly my favorite, but might be a good option, especially because Copacabana area is not so rich in vegan-friendly places. Some dishes are a bit bland. Natural juices are quite nice. Offers vegan versions of typical Brazilian dishes. Might seem too bland and simple for those who have more sophisticated taste. Most of the dishes are similar to vegan feijoada. Opens only for lunch and offers a full menu where you can choose between salad and soup as entree and between several feijoada-like dishes as main dish. Drinks and dessert are apart.